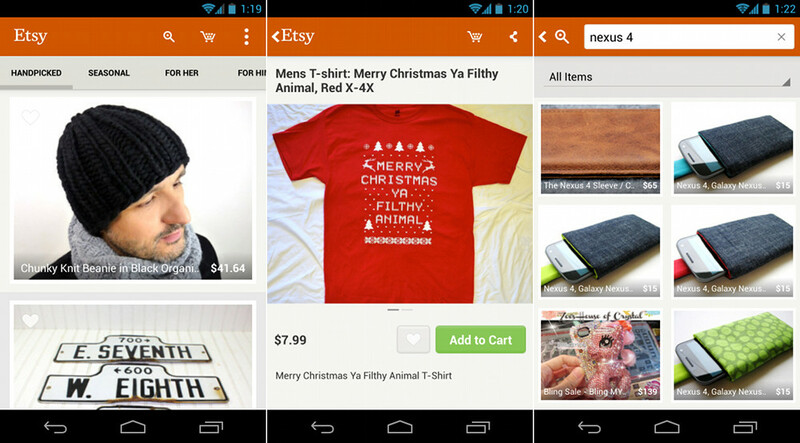 Just in time for you to finish up (or begin) your holiday shopping, the official Etsy app has arrived on Android, bringing hand-made craft goods to your fingertips. With beautiful Holo styling, the app is about as minimal as you’ll find, and that’s a good thing. You can quickly swipe between front page columns, view your cart, search for items, and see your account history. Items are easily marked as favorites and the checkout process is incredibly simple. Since I have yet to find the Etsy addiction, I’d love for you to share some of your favorite things, whether they be mobile-related, sporting goods, menswear, etc. in the comments.